Copper stamping contacts, terminal with supper good conductivity can be used on socket, plug, switch. We manufacture them with progressive die stamping with large volume, the material can be brass, phosphor brass, copper, BeCu with tin, silver, nickel plating. HAI TONG produce custom stamping parts inhouse with high speed progressive die stamping, the productivity is up to 150000pcs daily, material can be determined by customer's specific application. 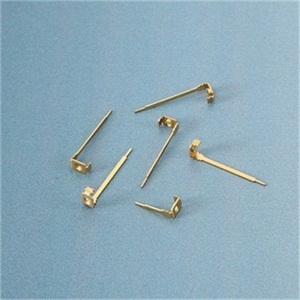 Description Copper stamping, brass stamping, copper contact, copper terminal, custom stamping pin. 1.Excellent corrosion-resistant in atmosphere,sea water,Non oxidative acid and applied widely in chemistry. 2.Super welding,it can be produced with cold or hot welding. 3.Excellent conductivity,it is second to silver on electrical conductivity and thermal conductivity,widely used on electronics. 4.Tensile can be 22-25kg/mm2,Elongation can be 45-50%,brinell hardness can be up to 35-45HB after heat treatment.